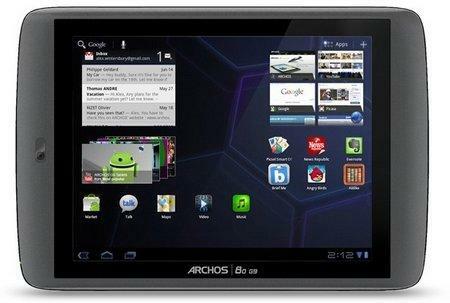 href=”http://www.archos.com/” rel=”homepage” target=”_blank” title=”Archos”>Archos has introduced the latest version 3.2.79 update for its Android 3.2 Honeycomb-powered tablets, including the Archos G9, that will solve a wide variety of bugs and glitches, including the “Keep Screen On” option that has been added to the browser options, in addition to other under-the-hood items such as fixes to hard drive power suspension issues. Archos has a full list of tweaks that you might want to check out if you happen to be toting the Archos G9 tablet around, but here are several which are the more notable ones. Your video playback experience would be improved where the MPEG2 format is concerned, while you will no longer experience the Archos widget getting stuck on the sandglass, with the File Manager giving the go-ahead for one to copy a file from Network. As for the display, the backlight now turns on at wakeup from suspend, and for folks who do experience a user interface freeze during animations should find this to be a thing of the past. You will be able to retrieve the update here, where it also applies to the smaller 80 and the full 10″ 101 versions of the tablet.